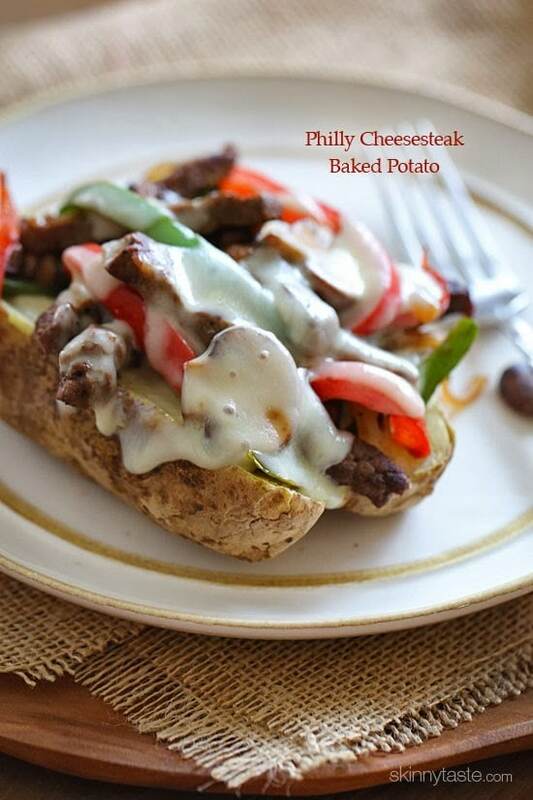 Quick skillet steak with onions, peppers, mushrooms loaded on top of a baked potato and topped with melted cheese – this Loaded Philly Cheesesteak Baked Potato is perfect for the meat and potato lover in your life! 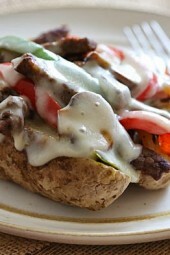 Loaded baked potatoes are so quick and easy to make. A few of my other favorites are Loaded Turkey Chili Baked Potato, Broccoli and Cheese Twice Baked Potato, and Sloppy Joe Baked Sweet Potatoes. I’ve had this idea for a while, and finally made it for dinner to test it out – start to finish this took 20 minutes and it was so good! I used a full fat provolone cheese, because I wanted the cheese to melt nice, after all this is a cheese steak and at 8 points plus for the whole meal I was able to splurge. If you want to use reduced fat, that’s totally up to you, you’ll save 1 point. with a traditional baked potato, it’s OK! Skinny Tip: If you buy bag of russet potatoes, the potatoes are much smaller than the ones they sell individually, they average about 5 to 6 oz each. Poke holes in the potato with a fork, then cook in the microwave using the baked potato setting until potatoes are soft and cooked through (about 8-10 minutes on high for 4 potatoes). If you don’t have a microwave, bake about 45 minutes at 400°F. Meanwhile, slice beef into thin strips. Season with salt, garlic powder and fresh pepper to taste. Heat a large skillet over high heat. When the skillet is very hot, spray with cooking spray and add half of the beef. 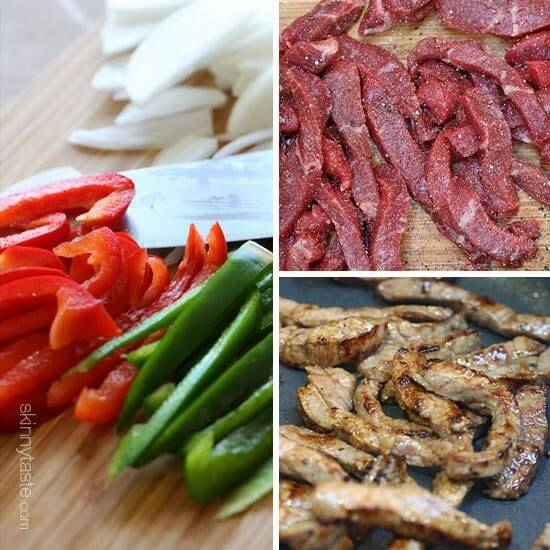 Cook one minute, then turn steak and cook an additional 30 seconds. Set aside in a large dish. Spray the skillet again and when it gets hot add the remaining steak, cooking one minute, then turning and cooking 30 seconds more. Add remaining steak to the dish. Return skillet to heat and spray once again with cooking spray; add onions and peppers and season with salt and pepper. Cook one minute, then turn and cook an additional 1 to 2 minutes or until onions are golden. Set aside with steak. 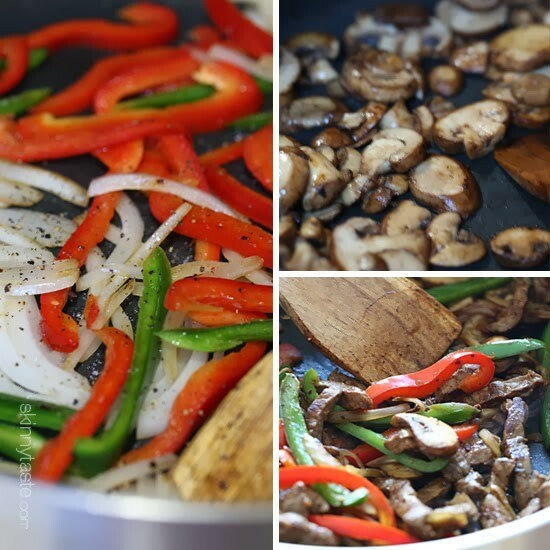 Lower heat to medium and add 1/2 tsp olive oil to the skillet, add mushrooms, salt and pepper and lightly spray the top of the mushrooms with cooking spray. Cook 1 1/2 minutes, then turn mushrooms and cook another minute and a half. 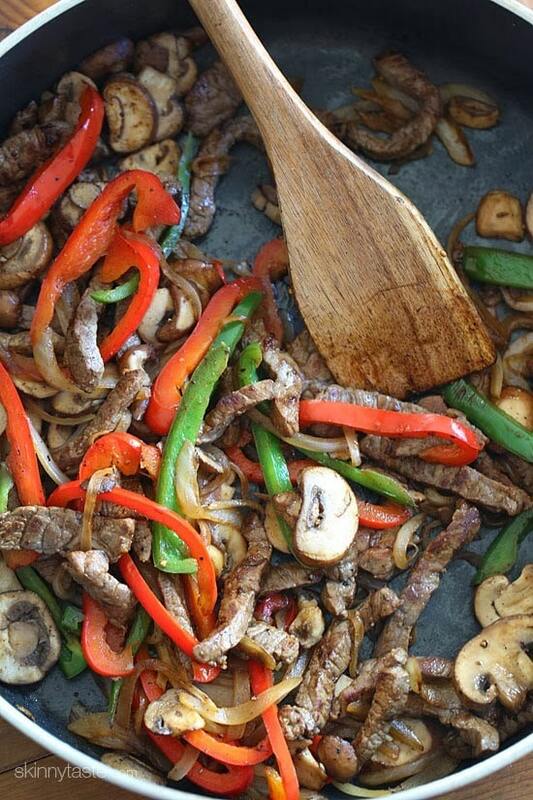 Add to dish with steak and onions and stir to combine. 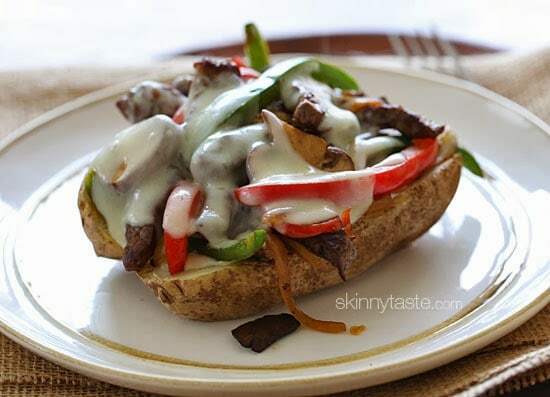 Split the potato in half lengthwise down the middle as I did in the photo then divide the steak and vegetables evenly over each potato and top each with a slice of provolone. Place under the broiler to melt the cheese, careful not to burn.